A program that will shuffle the order of the stars in the STARS.txt file. Works with a STARS.txt file with up to 2000 stars. Also individual star names cannot exceed 32 characters. Built with GC2 version 1.2 but should be fine with any version. 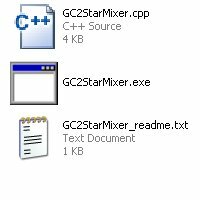 I have included the .cpp file if any modder wishes to incorporate it into their mod. Please give credit if you do. Enjoy all!